Hundreds of thousands of protesters have taken to the streets across the US to call for tighter gun control. The March For Our Lives movement arose after 17 deaths in a school shooting in Parkland, Florida, last month. Student leader and Parkland survivor Emma Gonzalez gave a powerful speech at the main Washington DC event. After listing the names of the victims, she stayed silent on stage for six minutes, 20 seconds – the time it took for them to be killed. More than 800 sister protests were planned nationwide and abroad, with solidarity events taking place in Edinburgh, London, Geneva, Sydney and Tokyo. As events began to draw to a close on the US east coast, they continued on the west, including a major demonstration in Los Angeles. Huge crowds – including a high proportion of young people and children – gathered along Pennsylvania Avenue, with placards reading “Protect kids not guns” and “Am I next?”. Singers Ariana Grande, Miley Cyrus and Lin-Manuel Miranda, the man behind hit musical Hamilton, performed on a stage erected in front of the US Capitol building. The music was interspersed with speeches from impassioned youth leaders. “We will continue to fight for our dead friends,” said speaker Delaney Tarr, a Parkland student. 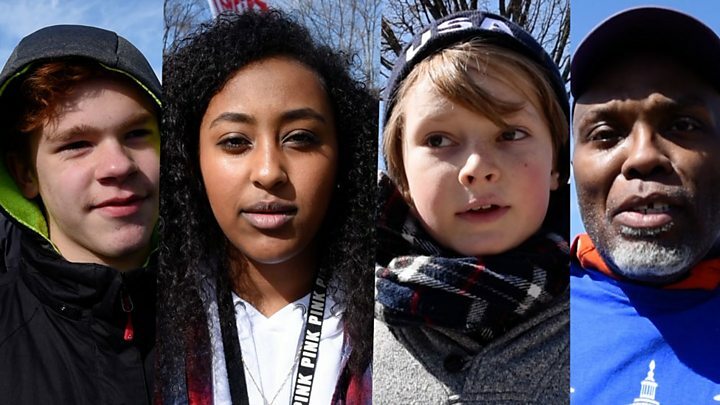 Some came from children who are just 11 years old, including Naomi Wadler, from Virginia, who spoke “to represent African-American girls whose stories don’t make the front page of every national newspaper”.